The journey of the deities to the world outside, starts with an elaborate royal ritual called Pahandi – literally, going forward in a step by step movement to the accompaniment of several devotees beating the ghanta, kahali and telingi baja. The ghanta is a type of a gong, shaped like a flattish hollow bowl, and is made of kamsa, bell metal, an alloy of brass and zinc. A small baton like stick made of a hard but flexible piece of cane is used to beat the simple musical instrument. The ghanta is made by traditional artisan groups – kansaris, who live in villages not far from Puri. Kahali is a type of trumpet while the telingi baja is a simple drum, a percussion instrument played on both sides with canes. The famous saint poet Salabega has immortalised the feelings of the devotees as they wait every year for fulfillment of their desire to see their dear dark darling, Kalia Dhana seated on his resplendent Chariot – Nandi Ghosa. Salabega had gone on pilgrimage and had fallen sick. He couldn’t return in time to see his darling Lord on the chariots and cried out in anguish from 750 miles away. He prayed to the Lord to tarry a while on the bada danda, the Grand Avenue till he could reach back to see the Lord. The compassionate Lord stayed on his chariot which could not be moved an inch forward till Salabega reached Puri and joined the devotees in prayer. As Lord Jagannatha and Lord Balabhadra are quite heavy, a wooden cross is fixed to their backs and thick silken ropes are tied round their heads and waists for their ceremonial procession – a ritual known as Senapata lagi. The deities during the anasara period are actually placed in the audience hall – Jagamohana and not in the sanctum – or deul on the elevated platform, their normal seat. From there the deities are moved first on to the sata pahacha or seven steps, outside the northern door of the natamandapa or the dancing hall. During the outward movement from the temple to the chariots, the procession of the deities is in a row and is known as dhadi pahandi or a group movement. All the deities move simultaneously. At first Sudarshana, the celestial wheel of Krishna-Vishnu, is brought out and placed in the chariot of Subhadra followed by Balabhadra, Subhadra and finally Jagannatha. The blowing of kahali, the clang of the ghanta, and the beating of the telingi baja in a unique rhythmic movement slowly rising to a crescendo herald the beginning of their movement. The two brothers, Balabhadra and Jagannatha are decorated with large, elaborate floral decorations called tahia. These are like huge crowns or tiara but are fixed at the back of their heads. These are made of a variety of white, orange and lotus flowers, leaves and pieces of cork fixed to a semi – circular heart shaped bamboo frame. The two brothers decorated with the tahias are carried forward in a slow, swaying movement, giving the illusion of a huge elephant gracefully and gently stepping out. The privilege of providing these tahias is with the Raghavadasa matha- a monastery associated with the temple. Hundreds and thousands of devotees eagerly await a glimpse of the deities. As the deities step out of the main entrance of the temple, the Sinhadwara – Lion’s Gate, the teeming devotees, bhaktas go wild with ecstasy, chanting the name of the Lord in a loud chorus. The chant Haribol – literally means to utter the name of Hari, the Lord. First comes Sudarshana who takes its place on the chariot of Subhadra. 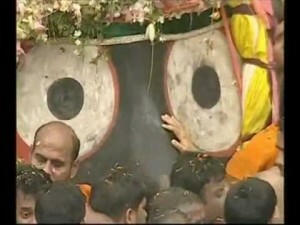 He is followed by Lord Balabhadra. Much smaller, Subhadra, the yellow-golden coloured younger sister of Jagannatha and Balabhadra, follows soon after. Short and slim, in contrast to her two brothers and much lighter, the lady is carried on the shoulders in a supine state. Her movement is much faster and the daitas carrying her almost rush through the process in a running movement. At last comes Lord Jagannatha, darling of the devotees, in a regal procession. Dancers perform traditional Odissi dance to the accompaniment of mardala and mridanga, traditional Orissan percussion instruments, as the procession moves forward. Devotees also perform sankirtan, ritual group chanting of the names of Lords with rhythmic jumping movements.